A robust mechanism to reference specimens held by natural history collections across the internet has been a topic of discussion in the biodiversity informatics community for some time. In the last few years stable HTTP URIs (URLs or IRIs) have been adopted by a number of major institutions so that today many millions of specimens are referenceable using this approach. More institutions are showing an interest in implementing stable URIs for their specimens and there is interest in adding more functionality to those that are in place. This is a simple service for testing specimen URIs. It is hoped it will accelerate adoption of URIs and improve quality/scope of implementations. 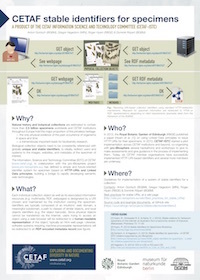 The development of use of URIs for specimens is very much a community effort involving institutions mainly acting under the umbrella of the Information Science and Technology Commission (ISTC) of the Consortium of European Taxonomic Facilities (CETAF). It gives some of the justification for their use as well as examples in a print publication. The paper was presented at a CETAF meeting. The presentation slides give a graphical summary [PDF]. A follow up meeting/workshop under the auspices of CETAF was held where a series of presentations were given. At this meeting BGBM Berlin, RBGE Kew and MNHN Paris expressed interest in implementation which set the ball rolling for wider adoption. The most recent discussions were at a CETAF meeting in Geneva where this tester site was proposed. CETAF now has a group dedicated to implementation of stable identifiers. There is discussion on best practice on this wiki. Please refer to these resources for detailed discussion of implementation of HTTP URIs for specimens. Only a summary is given below. Conceptually it is easy to divide implementation of HTTP URIs for specimens into three levels. Institutions can participate by implementing any of these levels. A simple HTTP URI is used to represent each specimen in the collection, or at least all those that have been databased and are available over the internet. The word 'simple' here means that the URI does not contain a query string or other information related to implementation of the server such as a .php or .aspx file ending. When the URI is resolved (e.g. used in the address bar of a web browser) then a useful, human readable resource is returned (i.e. a web page). Level 1 can be thought of as simply having a web page at a well designed address for every specimen. Institutions undertake to maintain these URIs even if their underlying database and web systems change thus providing stability. Other organisations can store and quote the URIs with confidence. Currently implementers tend to use a catalogue number or barcode number at the end of their URIs. The response to resolving the URI is an HTTP 303 redirect to another resource. The resouce redirected to depends on the Accept header given in the request. Typically it defaults to the web page as in Level 1. This keeps the implementation transparent to a human user but if a machine sets the Accept type to 'application/rdf+xml' then the result is RDF metadata about the specimen. Level 2 provides basic machine readable data and integrates specimen URIs with the semantic web. At level 2 the stable URI is acting as an identifier of a non-digital or "other" object from the point of view of the Semantic Web. This means that the server must not return digital data as it would if the URI was identifying a JPEG image for example. Instead the server must respond with an HTTP 303 Redirect code, known as the "See Other" code, to send the client to an appropriate digital resource that has information about the non-digital thing. Without this redirect mechanism it is difficult to make assertions in the data that are not ambiguous. As an example, if someone were to assert dc:created for the URI without the 303 mechanism it wouldn’t be clear if they were telling us when the HTML page, the RDF data or the specimen was created. We need to be able to clearly differentiate between these things and hence the 303 redirect is required for level 2 conformance. Level 2 doesn't specify the content of the RDF data. At Level 3 application specific data is encoded in the RDF or may be returned in response to other Accept types passed to the server. The tester tests levels 1 and 2 as well as an initial application under level 3. This initial application is the inclusion of some key fields in the RDF as part of the CETAF Specimen Preview Profile (CSPP). The CSPP has been designed to meet the use case of providing "pretty links" or popup boxes in place of displaying the raw HTTP URIs. If a database stores URIs for specimens in other collections instead of displaying just the URI to the user it could use CSPP data to display a summary of the specimen the user would see if they followed the link. It is analogous to the mechanism used by social media sites and search engines when linking to web pages. A demo of this is included on the implementers page. To get the popup demo to work responsively it was necessary to cache the data retrieved for each URI. This was done as a simple, one table MySQL database. As data accumulated in the cache it seemed logical to add a search facility using MySQL fulltext search and to seed the cache with some specimen URIs. This is a just-a-bit-of-fun feature but also demonstrates how simple it might be to build a proper index across multiple herbaria/museums if they fully implement presistent HTTP URIs. Also searching for a URI will force it to be saved or re-saved but to be indexed URI's need to have their domain registered in the config file. So it only works with collections we know about. This service is aimed at developers and will always be in development. It will improve is through use and the reporting of bugs. If it doesn't behave as expected or you would like it to do more please contact us.